reports that on 8 April 2016 that human rights defender He Xiaobo (not to be confused with Nobel Laureate Liu Xiaobo) was released on bail after over four months in custody in Guangzhou, Guangdong province. The workers’ rights campaigner had been detained on 3 December 2015 along with a number of colleagues and on 8 January he was formally charged with ’embezzlement’. Two other human rights defenders detained at that time, Zeng Feiyang and Meng Han remain in detention and are facing charges of “gathering a crowd to disrupt social order”. 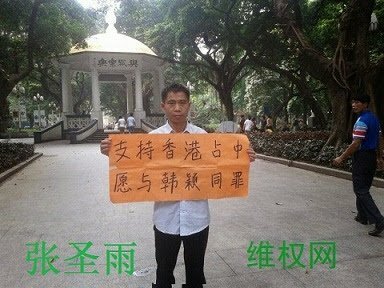 He Xiaobo runs Nanfeiyan Social Work Service Centre, an NGO campaigning for compensation on behalf of workers who have been injured during the course of their work. The centre’s registration was rescinded in 2015. https://www.frontlinedefenders.org/en/case/case-history-he-xiaobo.